Strolling about your favorite folk festival this summer there are at least two Shady Groves you might come upon. If you're attending Bean Blossom, here's the bluegrass version you may wander into. That's what some folks call a "show piece". Personally, I call it an excuse to call home, or visit the men's room, or have my wisdom teeth removed then and there. Anything to get me out of having to try to play that fast. In any case, that's not the Shady Grove we're adding to our Community Guitar repertoire. We're learning the one you'll come across among the old-timey fiddlers camped out at Union Grove. That happens to be where Ralph Rinzler met (some would say, "rediscovered") Clarence Ashley. For all we know, he was picking this very tune. 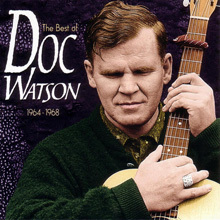 That cut is from a recording Ashley did with Doc Watson, but Doc has recorded it numerous times himself, usually both singing and playing lead guitar. One such recording dating from the late 60's is with Don Stoveron banjo. 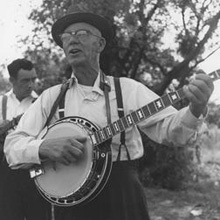 Stover is best known for his work with the bluegrass outfit Lilly Brothers & Don Stover, a setting in which he would most often have played Scruggs-style. (Legend has it that a traveling salesman told Stover in 1945 that Earl Scruggs was using metal picks so Stover made a set from a Prince Albert Tobacco tin.) But he could play clawhammer-style as well, as he ably demonstrates here. Audio Clip: Doc Watson and Don Stover pickin' Shady Grove. Many old-time tunes stick around, give or take, forever. Somebody, someplace, is going to be sawing away at Hog Eye till the hogs come home. But something about Shady Grove makes it hard to keep down on the fiddler's convention. Occasionally this inspires renderings that, I'm sure, drive the more trad-oriented to take a deep slug of moonshine. But for the rest of us, it's nice to be able to mine the rich ore of the old-time tradition even if we don't plan to make that our primary enterprise. Not many contemporary players have done just that more often or more successfully than Jerry Garcia and David Grisman. Great lovers and respecters of traditional music, they always bring it forth in their own distinctive and unabashedly contemporary voices. This clip is from their impromptu session from 1993—later dubbed The Pizza Tapes—which never fails to offer a refreshing dose of informality. 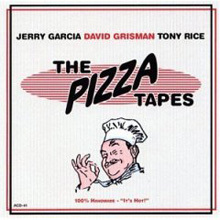 If you are either a fan of Grisman/Garcia collaborations or a careful reader, you'll note that the Pizza Tapes session also includes one of his generation's most influential flatpickers, Mr. Tony Rice. 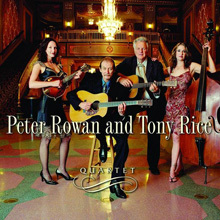 Rice is known for many things, among them the way he employs what some consider "jazz" chord voicings in his accompaniment of bluegrass and old-time tunes. As you might imagine, this has a way of lending a very contemporary feel to otherwise traditional material. In this next cut he teams up with another bluegrass innovator, Peter Rowan, to give Shady Grove a classy make-over. Toward the end of the clip you can also hear just a bit of the fine soloing of mandolinist Sharon Gilchrist who, before this gig, contributed her formidable talents to Uncle Earl.